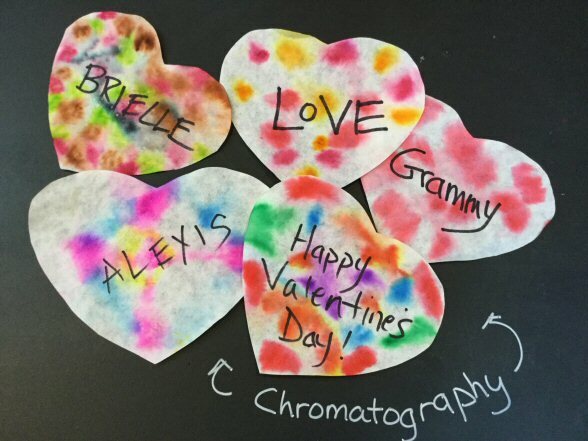 In this simple science activity, kids combine chemistry with art, using chromatography to make pretty valentines. Simple explanation: As the water moves through the filter, it dissolves the marker ink and carries it along. But notice that permanent marker doesn't move at all -- no matter how wet you make it. Why? 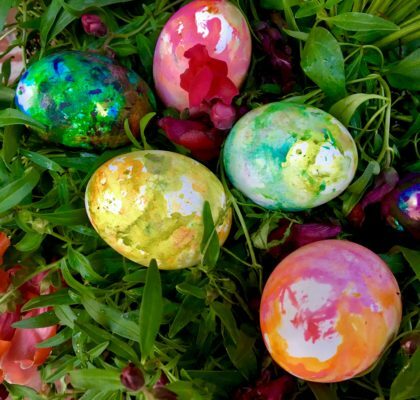 The ink in most washable markers is made of colored pigments and water. In our experiment, we absorbed ink using a coffee filter. When we added water to the filter, the ink dissolved and was carried along the filter at different rates by the water. How fast a colored pigment travels depends on the size of the pigment molecule and how strongly the pigment is attracted to the paper. If you look carefully, you should be able to see the colors in the marker separate out. So, for example, green marker ink will separate out into blue pigments and yellow pigments. Brown and black ink are the most interesting to watch, as they contain most of the different colors. 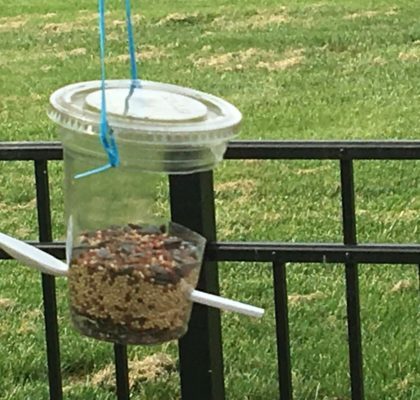 The water moves through the coffee filters because of “capillary action.” Capillary action occurs because water is sticky; the molecules in water stick to each other and all kinds of other things, such as glass, cloth, paper and soil. Water will keep “climbing” through substances until the pull of gravity is too much for it to overcome. The ink in permanent markers is not “soluble” in water – which means it cannot be dissolved by the water and carried along. That’s why the permanent ink didn’t separate in the experiment. But most permanent ink is soluble in rubbing alcohol! In chromatography, a gas or liquid (like water) flows through a stationary substance (like a coffee filter). Because different ingredients in a mixture are carried along at different rates, they end up in different places. By examining where the ingredients end up, scientists determine what was in the mixture to begin with. 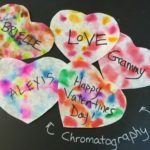 “Chromatography” derives from the Greek word for color, “chroma,” and writing, “graph.” Chromatography is a very important technique, and is used in many ways. Scientists use chromatography to find out what is in a solid or a liquid, or to determine what an unknown substance is. Detectives also use chromatography to develop clues and solve crimes. Be sure to do this project on a non-porous surface that will not be stained by the markers. Cut hearts out of the coffee filters. Cone-shaped filters work best. 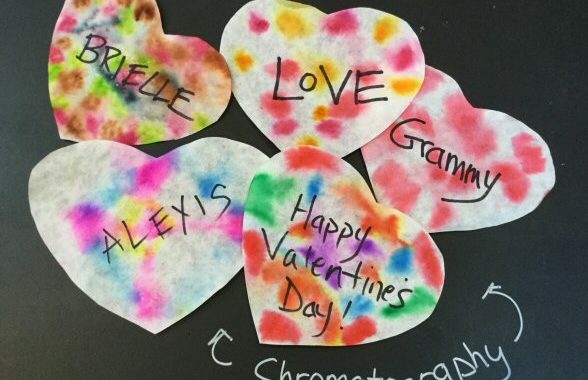 Use washable markers to make circles, dots, dashes and other patterns on the heart. Encourage kids to make dark marks and use lots of ink. To make the activity even more interesting, write a name or message on the heart using permanent ink. Place the heart on a paper towel. Be sure to rest the towel on a non-porous surface, as the ink may very well seep through. Using droppers, your fingers or a squirt bottle, very gently drop water onto the decorated filter. 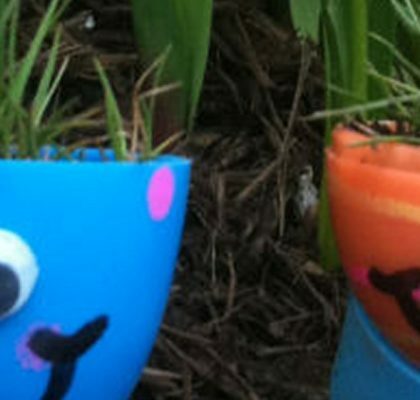 You don't want to make it sopping wet, just gently add bits of water and watch it run. Experiment with putting drops next to the ink vs. right on top. For best results, be sure to stop before the filter gets too wet or too much of the ink will seep out onto the paper towel. Why doesn't the permanent ink run? Can you see different colors emerging from a single spot of ink? What is happening?